When You Swallow a Raw Egg What Does it Do? Eggs provide a variety of benefits, but swallowing a raw egg might provide special boons for your health, as some nutrients can decrease when foods are cooked. Look to raw eggs for energy and improvements to sperm quality and fetal health, but understand the risks associated with eating them. Never consume eggs to treat a health problem without first seeking the counsel of your health care provider. Consuming a raw egg is a good choice for increasing the amount of energy you have on hand to help you move throughout your day. Your body reaches for the protein in your diet for fuel when you have inadequate amounts of carbohydrates in your meal plan. One large raw egg provides you with 6.3 g of protein, as well as other nutrients -- B vitamins -- that help your body use food for energy. You get small amounts of thiamin, vitamin B-6, pantothenic acid and folate, and raw eggs also serve as a good source of vitamin B-12 and riboflavin, all B vitamins important for energy. Fertility can suffer due to a number of reasons, but swallowing raw eggs might offer benefits if you have trouble conceiving a baby. Raw eggs are a good source of selenium, a mineral that might improve the quality of sperm. A large raw egg has 15.3 mcg of selenium; adults need 55 mcg of this mineral each day. 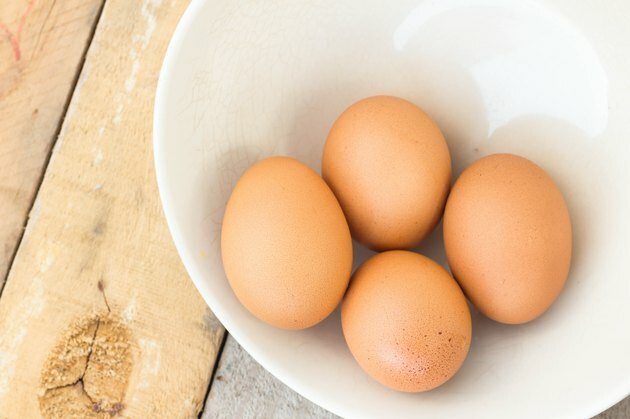 Raw eggs also might benefit male fertility thanks to the vitamin B-12 -- the University of Maryland Medical Center website cites weak research on the positive influence of vitamin B-12 on sperm motility. One large egg contains 0.4 mcg of this vitamin; your body requires 2.4 mcg daily. While eating raw eggs during pregnancy is not recommended due to food poisoning risk, doing so might help protect fetal health. Raw eggs are sources of folate and vitamin B-12, both of which protect against neural tube birth defects. One large egg contains 24 mcg and 0.4 mcg of these nutrients, respectively. Pregnant women require 600 mcg of folate and 2.6 mcg of vitamin B-12 daily. If you consume raw eggs while you are pregnant, seek out pasteurized eggs, which reduce your risk of problems. The food poisoning risk in raw eggs derives from a microscopic bacteria known as salmonella. The U.S. Centers for Disease Control and Prevention reports that approximately 1.4 million people contract salmonellosis annually, which triggers gastrointestinal problems and causes roughly 400 deaths each year. Rarely, salmonellosis from contaminated raw eggs can lead to Reiter's syndrome, a condition marked by arthritis, painful urination and eye irritation.